Ace2Thirteen Rummy is a new name in the online rummy website industry. We had a look into the website today and they have a banner saying “Re-design” with a Joker character of Batman holding a card. In first instance, the website didn’t even look professional. Getting to other tabs, we found that they are giving every new user with Rs.25 bonus for signing up. Not bad for new players as other rummy websites are also giving the same bonus amount. Instead of playing with Chips you have to play with gems in Ace2Thirteen Rummy. We still haven’t figured out how to monetize the gems to cash if we win a game of rummy. 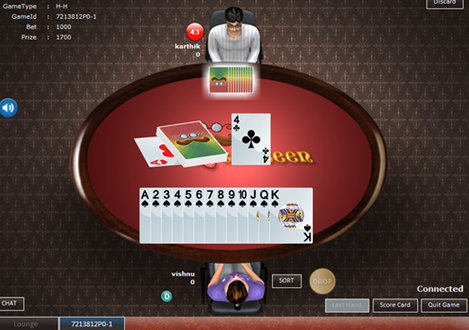 They are also having promotions just like other rummy websites which makes you to invite your friends. Unlike other websites which give a player Rs.1000 for every friend sign ups, Ace2Thirteen Rummy is only giving away Rs.50 for each friend joined and played. When we go to the gameplay part, the lobby doesn’t look that welcoming neither do the avatars used. The rummy website by Ace2Thirteen Rummy hasn’t impressed us a bit. You can read our reviews on other online rummy websites like Ace2Three, Rummy Circle, Classic Rummy etc. in our special category named Online Rummy Reviews. Please give us a feedback on our reviews if you find it true to what we said. Your feedback help us going and find the best news in the online rummy world.